By default, the length of each scene is dynamically determined based on the amount of text on each scene. For example, a scene with more text will stay on screen longer, and a scene with less text will go by faster. 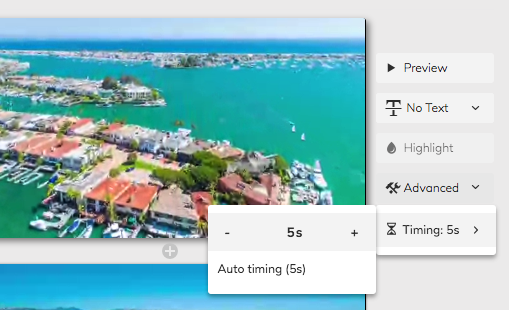 You can change the overall pacing of your video by using the pacing dropdown to choose from 'Fast' (20% faster) or 'Slow' (20% slower). This option will affect your video as a whole. You can also change the length of individual scenes. This option can be found on the right side of your slides under Advanced > Timing. You can also extend the length of a single scene by splitting your text in to multiple fragments to create a multi-part scene.